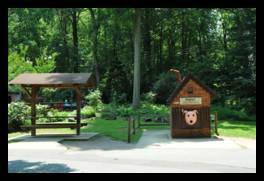 This large regional park has a playground with lots of different things to play on, a picnic area with shelters you can reserve, and a minature train, that you can ride around the park on. 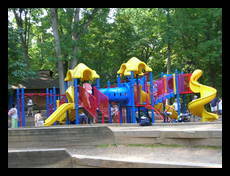 The play area is very popular and lots of kids go there on weekends. Most kids are in the 2-7 year range. There are 10 slides including three tall, fast ones, a spiral slide, and a coverd slide, as well as several small, short ones that are perfect for toddlers. There are at least a dozen pieces of equipment you can climb on, many are small and great for toddlers. 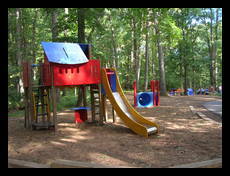 The whole playground is shaded by large trees, so even if it is hot outside, it seems cooler there. Another big draw is the small-scale train. It is about six feet tall and has five cars. 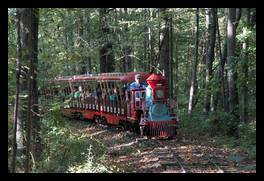 The train goes around a wooded area of the park and runs every half hour or whenever it fills up. 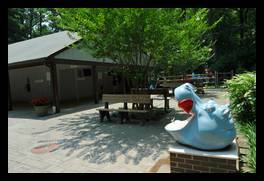 It runs 10am-4:30pm weather permitting, daily June through August and weekends in April, May, September, and October. It costs $1.75 per person age two and up. Near the train station is also a water fountain in the shape of a hippo head and a pig that eats your trash. 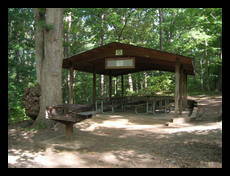 They have at least 10 pavilions that each have 6 picnic tables and a grill. They are available for rental through the Facility Reservation Request Center. Typical of government sites, they don't make it easy. 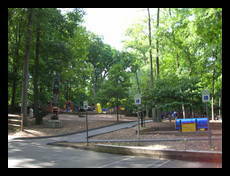 There are two large parking lots, one on Tuckerman lane that is right by the playground, and one on Westlake terrace that is convenient for the train rides and picnic pavilions. 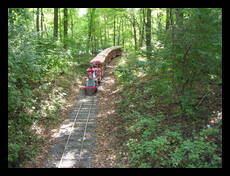 The park has over five miles of hiking trails, some of which run along Cabin John creek. Baby Swings 5 squeaky 3 in main play area, 2 near the train station. Standard Swings 6 good 4 in main play area, 2 near the train station. Bridges 2 good The large play structure has a couple. Pavilions 10+ good You can reserve these. Grills 10+ good One at each of the pavilions.